Sure, there are more than two reasons to own one or more handplanes. But if you work primarily with power tools and do not plan to unplug your shop in the near future, here are two benefits for adding a handplane to your tool arsenal. Have you ever experienced burn marks on the edge of your boards from your table saw? Some wood species such as cherry and maple are prone to it. You could take a pass on your power jointer to remove the marks; you could sand for, oh, about half an hour (and hope you don't round over the edges); or, you could take three micro-thin swipes with a handplane. There's nothing wrong with using a power jointer (I still use one), but what if the board has reverse grain and you get tear-out no matter which way you run the board through? That's also where a handplane shines. You can tackle the edge of a board from both ends to eliminate the problem of reverse grain. Today I was milling boards for a new project and experienced both burning and tearing. 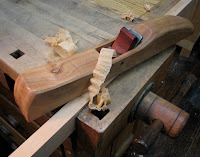 I reached for Devereau, my jointer plane, and hoped she was in a good mood. She was even downright delightful as she whisked away the blemishes. Good girl, Dev. You escaped the burn pile again. Ha, just kidding. You can also use a card scraper, cabinet scraper, or scraper plane for these two problems, but planes have many more uses than those listed above.